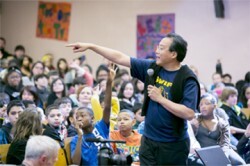 Celebrated musician Yo-Yo Ma visited George B. Swift Elementary Specialty School in Chicago’s Edgewater neighborhood to participate in an assembly showcasing student work focused on rivers and waterways. As part of the CSO’s Citizen Musician Initiative, the assembly featured performances by Ma and members of the Civic Orchestra of Chicago, the CSO’s pre-professional training orchestra.